Want free delivery on EVERY order? Join Everything Wine Unlimited today! PRIORITY SERVICE! All "Unlimited" orders receive priority picking and handling and are shipped as soon as possible! Everything Wine Unlimited membership is just $79/year +Tax. That's $7 a month for free delivery of all your favourite wines to your door, no matter how many bottles you want to stock up on! With our regular shipping rate of $15 that means you save if you place just 6 orders with us in a year! Available for purchase on the product page after you've selected delivery or add to your cart now! At anytime while you're placing your order for deliveries and adding wines to your cart, keep an eye out for "Get Free Delivery!" 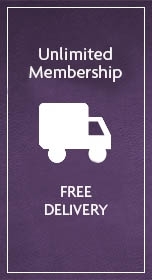 Your Membership will be added to your cart, and after your one-time payment, your deliveries will ALWAYS be FREE!